The Insight Analyzer is a netlist validation tool that provides coverage beyond the traditional flow of simulation / LVS / DRC. 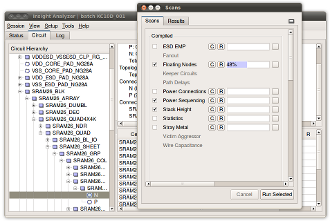 Using powerful heuristics-based circuit analysis techniques in addition to topological checks, the Analyzer performs comprehensive Electrical Rule Checking (ERC) with pinpoint accuracy. Comprehensive topological rule-sets with no programming required. Powerful what-if scenario analysis using intelligent, vector-independent heuristics. Comprehensive topological rule-sets with no programming required.Pinpoints the causes of failure, not just the symptoms. Highlights problem circuits on your schematic with integrated cross-probing. Optimized for high capacity to accomodate today's largest designs. Sutiable for block level design-rule checks as well as full-chip sign-off validation. Automated setup with built-in circuit recognition increases productivity. Plugin architecture supports custom rules alongside compiled checks. Powerful yet intuitive API with built-in iterators and pluggable code-blocks. Insight Analyzer is built on a simple idea: "Customizing" should be done from the mindset of a circuit engineer, not a programmer. If you have a custom rule in mind, you're probably thinking in terms of physical devices, rather than procedures. As you implement your custom rule, you'll want to maintain focus on circuit aspects. Procedural programming should not get in the way. Analyzer is not a programming toolbox. It's not yet another language. The underlying API does almost all the hard work. It's up to you to put together the right pieces for your particular application. If you're customizing code for the Insight Analyzer, you're probably not writing low level code. You won't flatten a circuit yourself and trace nets with your own code. Instead, you call the API to validate the circuit, then format text results for your end user. Any custom code you have needs to be portable and maintainable. For one thing, people do change jobs, leaving code for someone else to carry on. With the Insight API, the API does almost all the grunt work. Any custom rules you have will generally be relevant to the circuit application at hand, with little other glue holding it together. As your circuits change, it's easy to update the code. Insight Analyzer exposes all important aspects of its compiled API to script commands. * You build a custom module that leverages circuit exploration and query. * Your module can enforce rules in circuit checking, or simply list out information. * Write your results to the Insight GUI, then your user can crossprobe to schematics automatically. * Your module plugs into the main product to give your user one seamless flow.